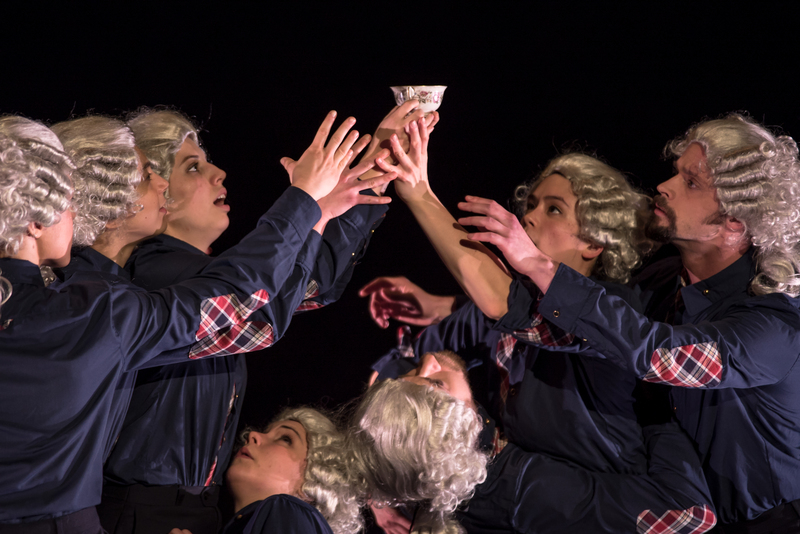 If you didn’t find yourself at 12th Avenue Arts this weekend, snickering at the ludicrous kerfufflings of seven tea-drinking, face-making misfits, or puzzling over the ease with which Amy Johnson blends dance and comedy, then you missed one heck of a performance. Believe Me Or Not, which debuted on Friday, March 6, was not your run-of-the-mill date-night show. Instead, it was a kaleidoscope peek into the inner workings of Johnson’s mind—a caffeine-spiked wonderland where 18th century parliament meets the Mad Hatter. With original music composed and played by the brilliantly talented Nico Tower (accompanied by cellist Daniel Mullikin), Believe Me Or Not took audiences on a whimsical tea-time journey through the curious ponderings of peacekeepers, groundbreakers, and artistic rebels in a beautiful mix of reality and dream. Because the work took inspiration from Dadaist writer Hugo Ball, it came as no surprise that Johnson’s latest show blended routine with idiosyncrasy. A sort of “anti-art” concerned more with the offensive than the appealing, Dada was an artistic protest of the ordinary. It sought to oppose the social constructions of the colonialists, nationalists, and bourgeois that perpetuated conformity and instigated the violent outbreak of World War I. For Dadaists, Ball says, “art is not an end in itself…but it is an opportunity for the true perception and criticism of the times we live in.” Johnson, who has proved to be an intellectual, text-driven creator, choreographed just that: the physical manifestation of a dream world, and one that spun history and modernity into a commentary on proletarian tedium and the tragic comedy of contemporary life. Despite its lack of a true narrative arc (a choice that arguably reflected the monotony and unpredictability of life), what made Believe Me Or Not most notable was its extraordinary compositional clarity. 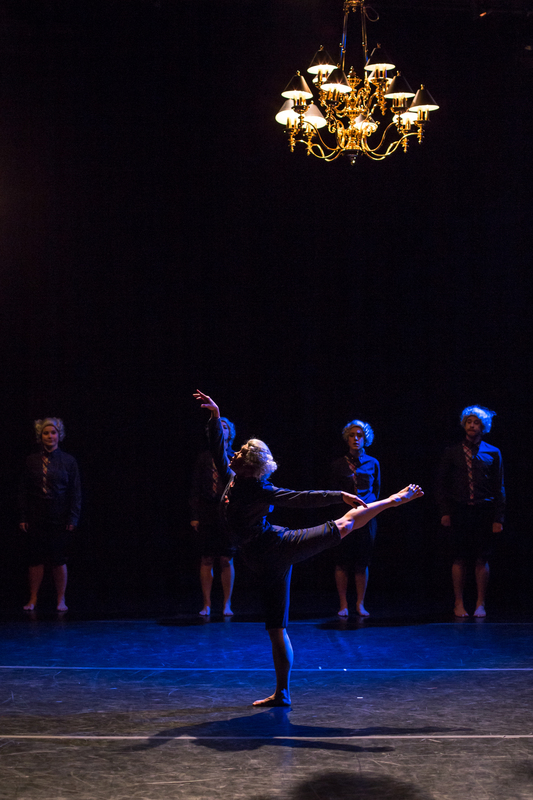 Johnson seamlessly blended pure movement phrases with comedic sections; the dancers easily shifted between the traditional dance vocabulary and eccentric tea-drinking shenanigans. Clearly influenced by Johnson’s partiality towards Cunningham-style movement, the technically grounded choreography incorporated high leg extensions, linear sweeps of the arms into classical shapes, and a variety of turning sequences that reflected the whirring precision of factory appliances. The exaggerated square-ness and simplicity of the more technical movement was a welcome contrast against the backdrop of the unpredictable compositional choices throughout the piece. Duets, trios, and group sections divided the work sectionally as well, making for interesting spatial patterns and an array of scene-like snapshots. The dancers, clad in blue-collar uniforms and white wigs, were not only exceptionally talented as technicians, but revealed true acting chops as well. With their expressions of child-like excitement and exaggerated curiosity toward the ordinary, they had audiences cackling with amusement. Dancers dove to the floor like arctic penguins, interrupted one another with bizarre noises, presented infomercial-style ads for the “Zen Cup,” and carried sky-high stacks of china saucers that tinkled and swayed precariously as they spoke. Yet what made Believe Me or Not so funny, engaging, and worthwhile was not merely the use of odd tricks or beautiful technique; it was the genuine humanity with which the artists spoke, danced, and interacted with one another. It was captivatingly innocent in a sad “who are you?” and “where has our authenticity gone?” sort of way. It was magical. Pure. A complex assessment of life as we know it. A Dada-style protest of the ordinary. It was a picture of the human capacity for simultaneous seriousness and play. So if you happened to spend this weekend pretending to be busy (while really just soaking up some much-needed vitamin D), you’re still in luck. Believe Me Or Not continues its run with two more shows this weekend, March 13-14 at 8 PM at 12th Ave Arts. 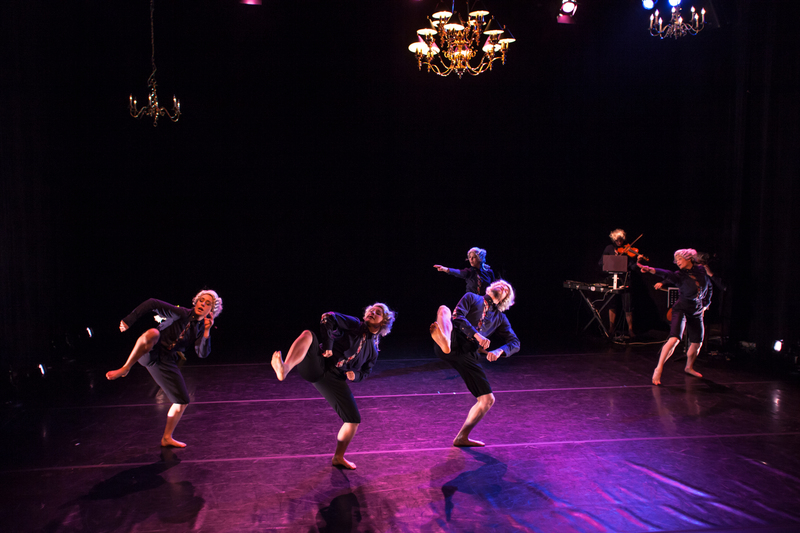 Go ready to be swept away on a wacky, exultant, tea-time journey, and to be blown away by the virtuosic talent of dancers, musicians, and choreographer alike. Tickets for Believe Me or Not can be found here. For more information on Amy Johnson and AJnC visit her website. Information about composer and musician, Nico Tower can be found here.